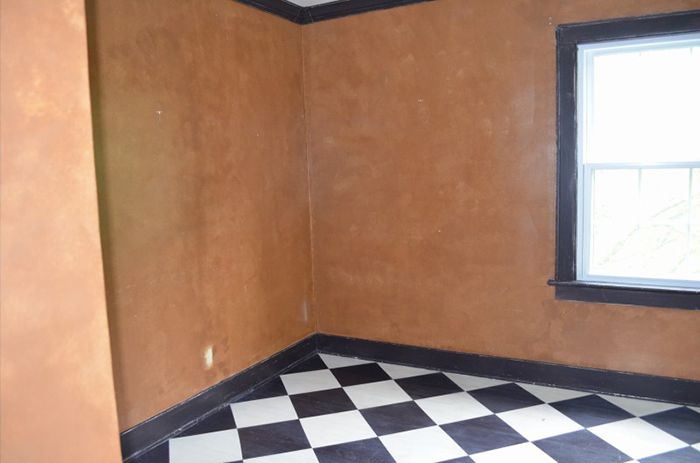 I may say this again about another room, but this one may have been the ugliest in the house when we bought it. There were so many things about the space that just didn’t make sense, starting with the entryway. You had to walk down a small hallway to get into the room, which along with the dark walls, made the entire room feel like a cave. 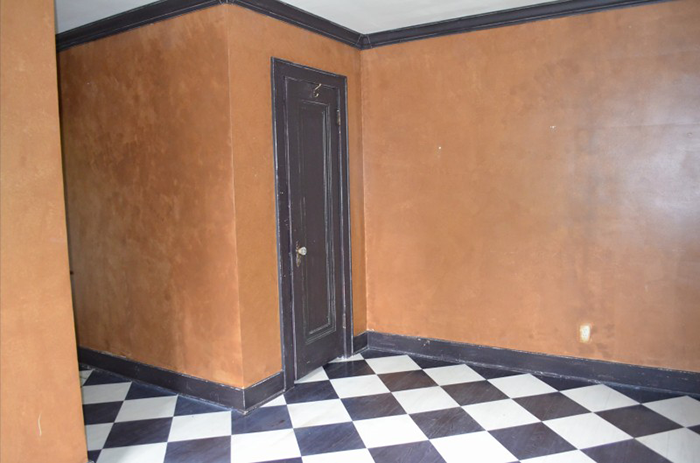 The paint on the wood floors was completely not our taste and made the room feel smaller. 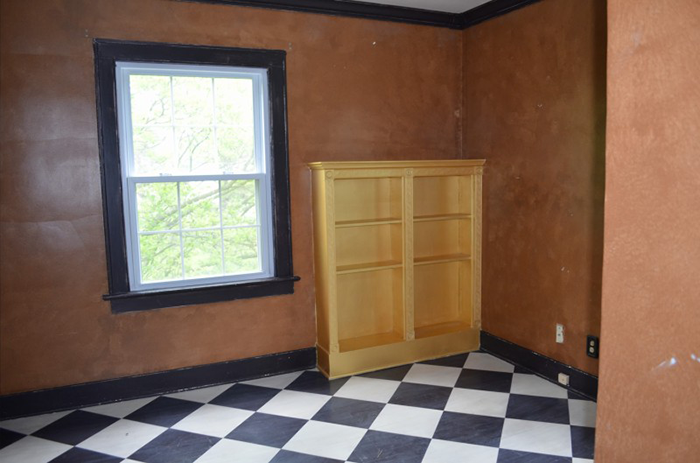 That dark door you see is a closet and a very small, narrow one at that with minimal storage. That gold thing in the other corner is an oddly-placed, built-in bookshelf. The layout of the room was a major challenge. We knew it was going to be a guest bedroom for sure, but could potentially, one day, be another child’s bedroom, so it had to be made larger. Jackson’s bedroom is huge, so if this room were to ever belong to another child in its original state, I’m pretty sure that child would think we very much favored Jackson (thankfully we fixed it, but Jackson’s only child status remains firmly in tact) because you couldn’t fit anything but a twin bed in there, if you were lucky and creative. 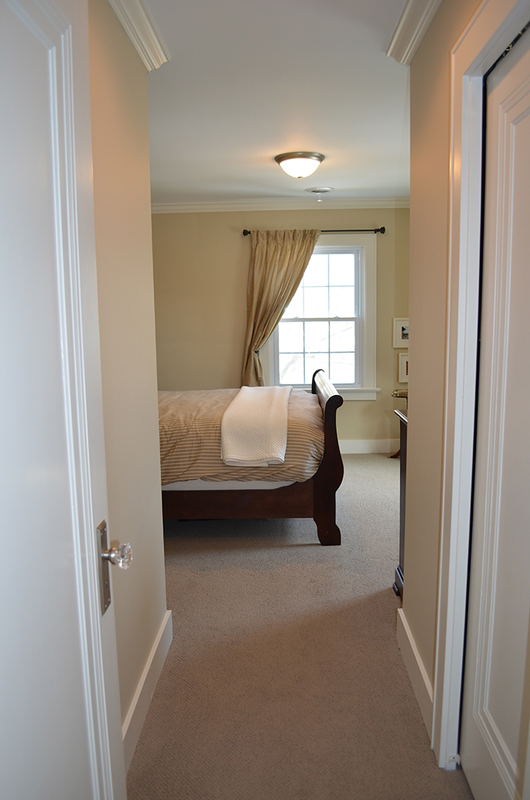 The biggest problem that was making this room smaller was the bathroom, which I mentioned in this post that we removed and replaced with a bigger closet space, meaning we were able to get rid of the awful mini-closet and make that hallway entry to the room much shorter. The laundry chute was also in this room and we really couldn’t see ourselves using it, so we removed it. The floors were original to the house (but the paint obviously was not), but we, personally, don’t like wood floors in bedrooms so they were ripped out and replaced with carpet. 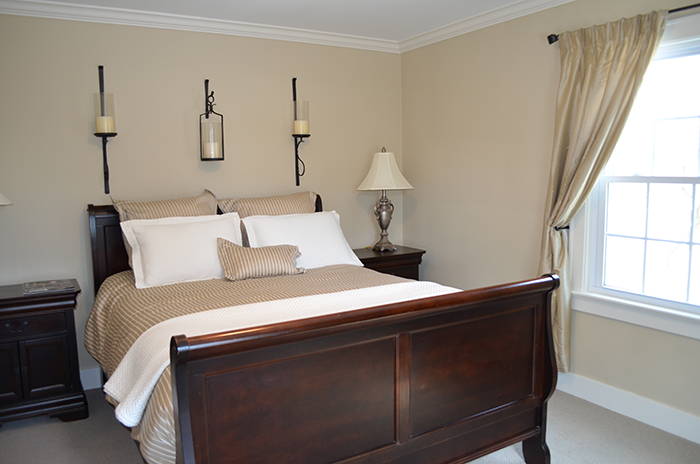 We wanted to tie in color with the rest of the house and brightened up the room with a light tan paint with a little bit of a gray value in it. 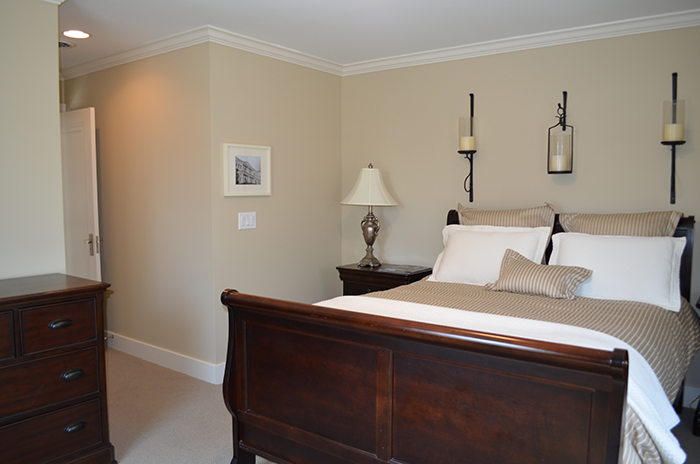 It is actually one shade lighter than Jackson’s bedroom, which you’ll see very soon – it is ALMOST done. 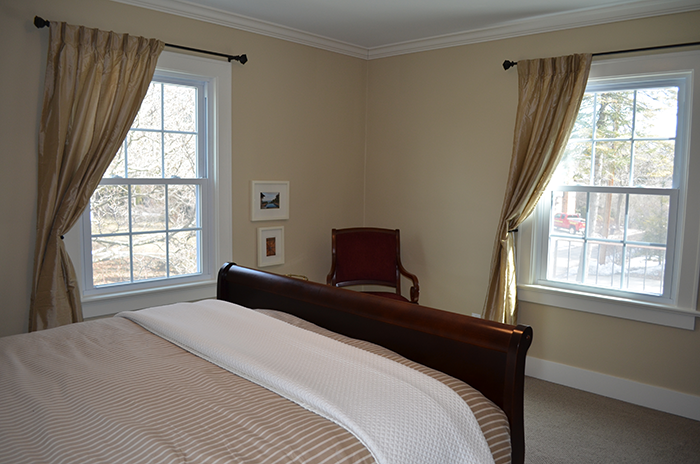 Windows were replaced in the entire house, including this room and that also helped brighten things up. We’ve only had one set of guests stay in the room, but it is definitely a more comfortable space than it was before and we’re very happy with it. We have had this Restoration Hardware bedding for a long time, so I wouldn’t mind replacing it with something new before too long, but I still like it so I’m not in a hurry to get rid of it. As far as other little decorating items are concerned, the Pottery Barn frames are filled with photos from our trip to Asia a few years ago and the chair and table in the corner are antiques that my parents gave us. I would probably re-upholster that chair too but only if/when I replace the bedding.